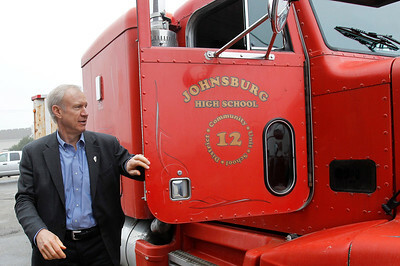 Matthew Apgar - mapgar@shawmedia.com Governor Bruce Rauner exits a truck regularly worked on by Johnsburg High School vocational students on Wednesday, April 8, 2015 in Johnsburg. Rauner, who was given a tour of the school by members of student government, spoke to students in the vocational programs as well as the AP government classes. 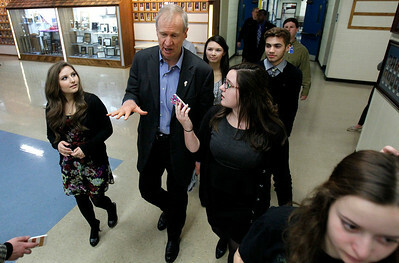 Matthew Apgar - mapgar@shawmedia.com Governor Bruce Rauner answers questions from students as he takes a tour of Johnsburg High School on Wednesday, April 8, 2015 in Johnsburg. Rauner spoke to students in the vocational programs as well as the AP government classes.